A story of a back-street boy, who, unwanted and unloved, rejected by society, his teachers and finally his adopted family, had one burning ambition: To become someone. There was Claudia to help. A first experience in the joy of young love. Diego proves himself a swimmer. Against all the odds he becomes the championship hope of the very people who rejected him. 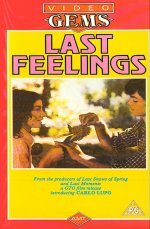 Last Feelings is one boy's dream of happiness that turns to tragedy. He had so much to live for but so little time to live it. See also The Last Snows of Spring and Last Moments.